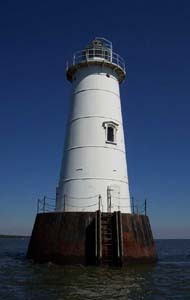 Built in 1880, the 60 foot (18 m) tall Great Beds Lighthouse sits atop a caisson. It is constructed of white steel plates. The lighthouse is located about 3/4 mile (1.2 km) off Staten Island, New York in the mouth of the Raritan River North of South Amboy. Accessible only by boat. Site and tower closed. 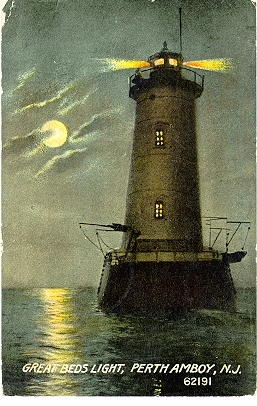 In the late 1800s there was a dispute between New York and New Jersey as to whom the lighthouse belonged. Eventually New York gave up the fight for the lighthouse. It was automated in 1945.Today the lighthouse is the official symbol for the small city of South Amboy.